Every large object in the solar system has a gravitational force. The larger the object, the stronger that force. Since the sun is the largest solar body, it has the strongest gravitational force in our galaxy. The earth and all the other planets are constantly pulled toward the sun. If they weren’t, they would go spinning off into space and that would be the end of things as we know them. But, the planets don’t move closer to the sun. They stay on a pretty consistent track orbiting around it. The reason for this is their movement. The earth, for example, moves around the sun at a rate of about 2 miles per second – pretty fast. This forward movement keeps the earth from falling into it. Think about how a tether ball works. The ball (the earth) is attached by a string (gravity) to the pole (the sun). As long as the ball keeps moving, the string remains extended and the ball flies around the pole. If the tether ball stops moving, the string and the ball fall to the pole. The earth’s movement around it is similar to the action of the tether ball. It is 300,000 times heavier than the earth and 1,000 times heavier than the largest planet, Jupiter. Its gravity keeps the planets aligned in orbit. The earth’s gravitational force prevents us from floating off into space and also keeps the moon nearby. Question: Will the earth always orbit the sun? Answer: It is made up mostly of burning helium and hydrogen. Scientists believe that when the helium is completely burned, the sun will expand. When this happens, it will engulf the earth and other nearby planets before collapsing and becoming a small star. Don’t worry, this process (if it really happens) will take millions of years. 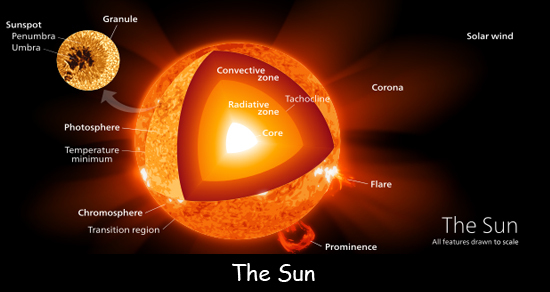 Visit NASA to learn more about the sun.